Latest views from Alex Sidorenko on how “innovation”, lack of business acumen and consultants are killing modern risk management in non-financial organisations. Some sources suggest probability theory started in gambling and maritime insurance. In both cases the science was primarily used to help people and companies make better decision and hence make money. Risk management used mathematical tools available at the time to quantity risk and their application was quite progmatic. Banks and investment funds started applying risk management and they too were using it to make better pricing and investment decisions and to make money. Risk management at the time was quite scientific. H. Markowitz, M. Miller, W. Sharpe won a Noble prize in 1990 for CAPM, a tool also used for risk management. This doesn’t mean risk management was always always accurate, just see the case of LTCM, but one thing for certain risk managers did apply the latest in probability theory and used quite sophisticated tools to help businesses make money (either by generating new cash flows or protecting existing ones). Then came the turn of non-financial companies and government entities. And that’s when risk management started becaming more of an art than science. Lack of reliable data to quantify risks (Douglas W. Hubbard in his books actually proved this to be not true). Today, there is literally no excuse for not quantifying risks in any type of an organisation. Lack of demand from the business. Many non-financial organisations at the time were less sophisticated in terms of planning, budgetting and decision making. So many executives didn’t even ask risk managers to provide quantifyable risk analysis. Lack of qualified risk managers. As a result, many risk managers became “soft” and “cuddly”, not having the skills or background required to quantify risks and measure their impact on business objectives and decisions. This was fine for the time, it was part of the learning curve, I guess, and many of the non-financial companies quickly learned which risks to quantify and how. Other companies that failed to mature usually lost interest in risk management, or should I say never saw the real value. Instead of being progmatic, simple and focused on making money, risk management moved into the “land of buzz-words”. If you are reading this and thinking: “Hold on, Alex, risk velocity is important, organisations should be risk resilient, risk management is about both opportunities and risks, risk appetite, capacity and tollerances should be quantified and discussed at the Board level and inherent risk is useful.” Congratulations! You may have lost touch with business reality and could be contributing to the problem. Today, even the most advanced non-financial organisations use the same risk management tools (decision trees, Monte Carlo, VaR, stress testing, scenario analysis) created in the 40s and the 60s. The latest research in forecasting, modelling uncertainty, risk quantification and neural networks is mainly ignored by majority of risk managers in non-financial sector. Ironically, many organisations do use tools like Monte Carlo simulations (developed in 1946 by the way) for forecasting and research, but it’s not the risk manager who does that. Same can be said about the latest development in blockchain technology, arguably the best tool for transparent and accurate counterparty risk management. Yet pretty much ignored by risk managers. It’s also been years since I last saw a scientist present at any risk management event sharing new ways or tools to quantify risks associated with business objectives. Same can be said about the overall poor quality of postgraduate research published in the field of risk management. Unless we are talking about non-for-profit or a government entity, the objective is simple – make money. And while making money every organisation is faced with a lot of uncertainty. Lukely business has a range of tools to help deal with uncertainty, tools like business planning, sales forecasting, budgeting, investment analysis, performance management and so on. Risk management has become an objective in itself. Executives in non-financial sector stoped, or maybe never have, viewing risk management as tool to make money. Risk managers don’t talk, many don’t even understand, business language or how decisions are being made in the organisation. Risk analysis is often outdated and by the time risk managers capture it, important business decisions are long done. Despite the extensive research conducted by Noble-prize winners D.Kanehmman, A.Tversky and others, risk managers continue to use expert judgement, risk maps/matrices, probability x impact scales, surveys and workshops to capture and assess risks. These tools do not provide accurate results (mildly put), they never have and never will. Just stop using them. There are better tools for integrating risk analysis into decision making. Building the culture of risk awareness is critical to any organisation’s success, yet so few modern risk managers invest in it. Instead of doing risk workshops, risk managers should teach employees about risk perception, cognitive biases, fundamentals of ISO31000:2009 and how to integrate risk analsysis into their day to day activities and decision making. Instead of sticking to the basics and getting them to work, many are too busy chaising the latest “buzz words” and “innovations”. Remember, how “resilience” was a big thing few years ago, before that was the “emerging risks”, also “risk intelligence”, “agility”, “cyber risk”, the list goes on an on. It seems we are so busy finding the new enemy every year that we forgot to get the basics right. Consultants lately seem to have too much say in how modern risk management evolves. Latest installement was the new COSO:ERM draft, created by PwC and published by COSO this June. And what a load of bullsh@t that was. The authors sure did “innovate”: among other “useful ideas”, they came up with a new way to capture risk profiles. Nice… if risk profiling was the objective of risk management. Sadly it is not. Risk profiling in any form does little to help executives and managers make risky decisions every day. For more feedback on COSO:ERM click here. 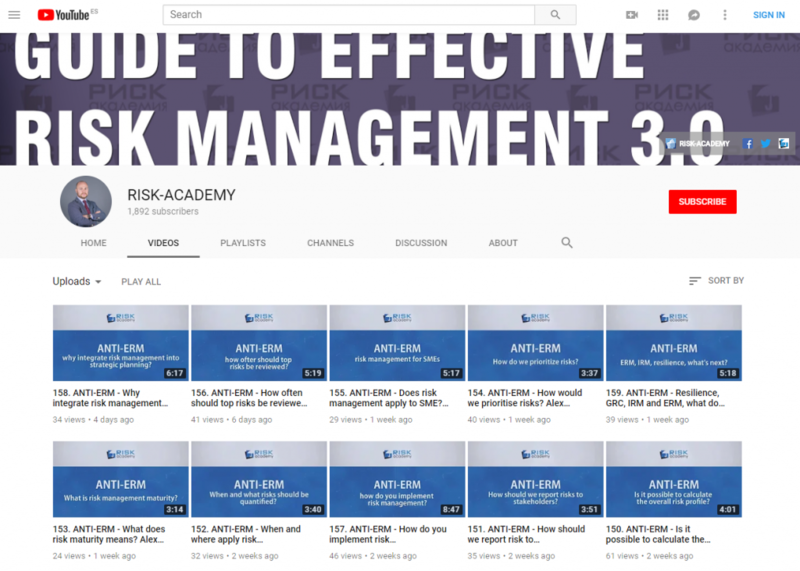 To be completely fair, the global team currently working on the update for the ISO31000:2009 also has a few consultants, who have very limited understanding about risk management application in day to day decisions and in helping organisations make money. I think it’s time to get back to basics and turn risk management back into the tool to help make decisions and make money. Interested to hear your thoughts, share, like and comment below. I realize that English is a second or third language for you but if you are going to post in a non-native language, then you should probably have a native speaker proofread your work. I stopped counting at two dozen spelling errors and use of incorrect words; didn’t even bother with the punctuation issues. It really does damage your credibility and ability to deliver what is, otherwise, a good message.